We are all lucky enough to be surrounded by people that have things to celebrate. Marriages, babies, new homes, birthdays, graduations, the list is endless and the announcements never end. Gifting can be a chore, so I try to scout out new and fun ideas to spice things up from the usual registry or stereotypical items. When I come across a gift idea that I like, I try to take note so I can use it when I receive that next text, email, facebook message, phone call or invitation announcing a new milestone. This one caught my eye in the latest InStyle and I think it is such a fun (and inexpensive) idea for gifting a new neighbor or for a housewarming. 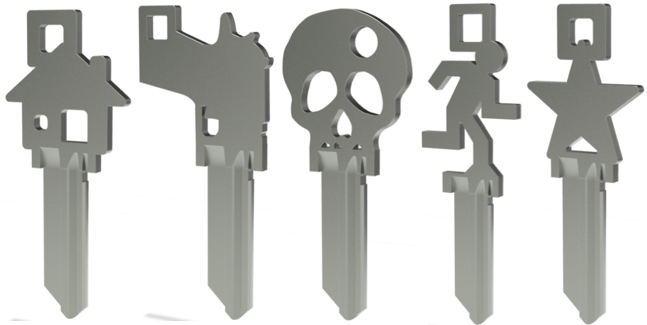 At just five dollars a pop, these Stat Keys will make a great statement to any key chain. Plus, it makes it very easy to recognize what key is for what door. They keys are delivered form Stat blank, so a quick trip to the hardware store or locksmith will get them cut. Of course, there is no harm in gifting yourself a couple as well. Do you have any fun gift ideas that you want to share? Wonderful idea! I would like to purchase a couple of these for my kids. They're gonna love it! Now I need to find a locksmith, who would cut them for me. Maybe they could 24 hour locksmith new york? Are you more interested in doing security work instead of using a locksmith? Think about the value of the things you want secure. Are you prepared to take such a risk? These tips will help you in securing a locksmith. - locksmith . http://24-locksmith-miami.com/ I think it's will be perfect to me find professional activity about it. Thanks in advance for watching! I'm waiting for your answer! Every day I visit a number of blog sites to see content, however this offers quality based content. Good job. You can search top Locksmith Near My Location which give better service. These keys are very amazing for door locks. If you are looking for Residential Garage Door Repairs Vancouver, visit comfortdoors.ca .